Rumor: Super Mario Coming to Wii 2/Project Cafe- Could it be a Launch Title? 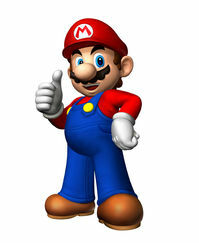 Honestly, the fact Mario is coming to Wii 2 isn’t a surprise. It’s coming to the console at some point. However, could it be a launch title? Early game listings at Gamestop have “Super Mario” slated for Wii 2, and with a listing this early it can sometimes imply a launch “window” release for Super Mario, or even more likely a same day launch title. We’ve talked about this before, and it makes logical sense for Nintendo to use Mario as a launchpad for the new system. While that wont win back the entirety of the core crowd, it would certainly be a nice start. Is it possible Nintendo is working on two Mario games right now? We know Super Mario 3D is coming later this year, so maybe production has already begun for a new Cafe game. Do you want such a title (if it’s a launch game) to be something in similar vein to New Super Mario Bros. Wii, or a 3D game sequel like Mario Galaxy 3, or something else along those lines.